Hull Daily Mail - Tuesday 30 September. 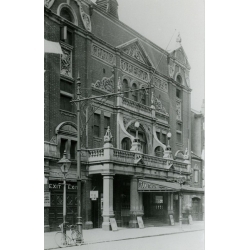 Grand Theatre, Hull. "The character of Inspector Grady, an American detective chief, entrusted to Mr Charles Mortimer, who imparts an official American "snap" into his work." Nottingham Evening Post - Tuesday 2 December 1924. Theatre Royal, Nottingham. 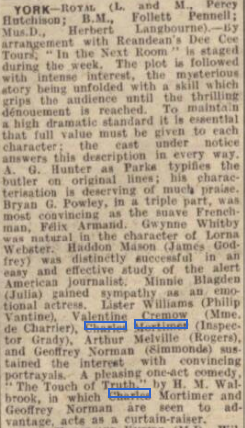 "It is admirably played by a company, including Miss Gwynne Whitby and Mr Haddon Mason as the two young people whose romance pleasantly varies the breathless sensations: Mr A.G Hunter as the humorous butler, Miss Minnie Blagdon as Julia, Miss Valentine Clemow as Madame de Charrier, Mr Lester Williams as Vantine, Mr Charles Mortimer as Inspector Grady and others." .... and at the Theatre Royal, Nottingham. 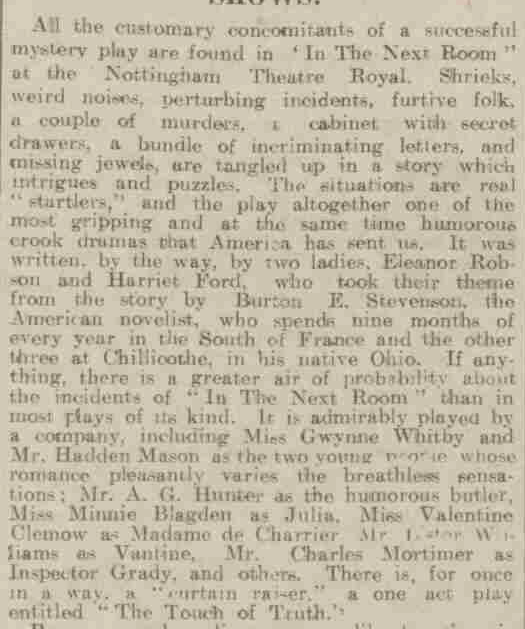 Article from the Nottingham Evening Post on 2 December,1924. From the Edinburgh Evening News of 9 September, 1924. A THRILLER THE KINGS. Modern writers mystery stories seem to have the knack of arousing suspicion out of practically nothing. The visitation of a house by strange characters; curious behaviour by the servants; reluctance to refer to incidents in past life by the occupier of the house; all this play their part in the majority of crime dramas of the present day. All these features are linked in In the Next Room at the King’s Theatre, following a couple of mysterious murders supposed to be connected with the introduction a famous cabinet. The air of mystery is deep throughout the play; the police and the audience alike are baffled. There is no doubt it would require the gifts of a Sherlock Holmes to eliminate “possibles'' and deduce the probable criminal. The odds are that even in the end the conclusion come to would be found wrong. It is a surprising mystery, one of the most thrilling and interesting yet produced. Needless to say a capable company is required to interpret the play, and the cast at the King's is first-class. Chief honours go Mr A. G. Hunter as the butler Parks. He presents, true to life, the “canny” Scot who continually has theories as the result of “putting two and two together.“ Mr Hunter’s is a fine study. 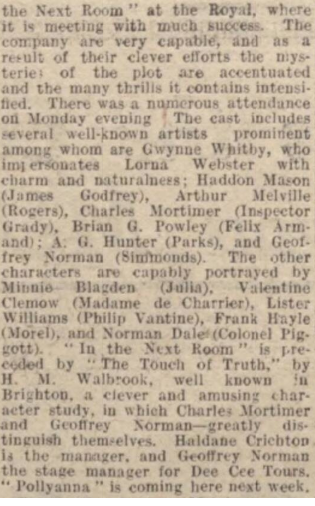 As Rogers and Inspector Grady Messrs Arthur Melville and Charles Mortimer carry out their parts in dramatic fashion, while Miss Minnie Blagden as Julia and Miss Gwynne Whitbv as Flora act charmingly, and one cannot but admire the manner which the former unmasks the murderer. 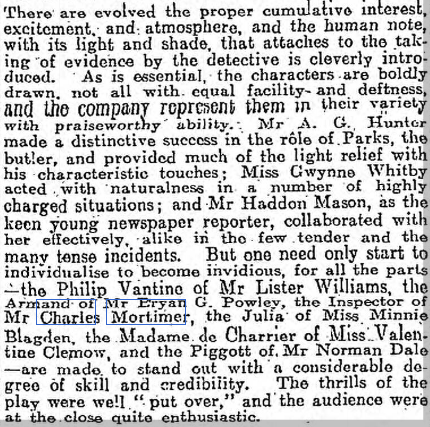 The woman triumphs over all the crime investigators, and the criminal speaks correctly when stating “A woman’s wit is worth that of a dozen men.” That remark can undoubtedly be also applied to the authoresses of the play. Theirs has been smart work. Taken from The Stage of 30 October, 1924. Taken from the Daily Mail, 30 September, 1924.